Need a new Fly Line? Well this weekend’s event will help you save some money on your next line purchase! Promotion is only valid at this Saturday’s (June 16, 2012) event. That’s it! 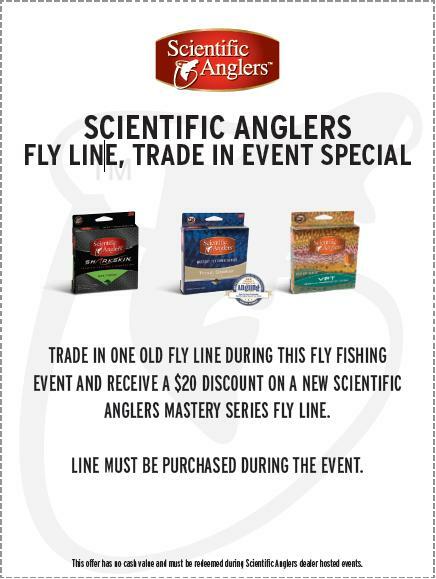 Just bring in an old fly line and the coupon above to get a discount on your next one! We look forward to seeing you this Saturday! Eric Kraimer is our Scientific Anglers, Rainy’s Flies, Buff, Ross, and Simms representative and he will be here to answer any questions you have about their products. Eric will also be giving a presentation on wet wading and will be showcasing several products that will make your summertime fishing trips even more enjoyable! Eric will be in the shop from 10:00A.M. – 3:00P.M. We look forward to seeing you here!